The comment-response campaign is the foundation of MSGHero and where we started! We pioneered this feature in the messenger marketing community! What is a Comment Response Campaign? MSGHero allows you to use a comment-response campaign to 'trigger' (send) an automated custom personal Facebook message to ANYONE who comments on ANY of your Facebook posts and Facebook ads. Anytime someone comments on any of your selected Facebook posts or Facebook ads, that person is sent a Facebook message (that you can customize) that lands directly inside of their main Facebook inbox (just as if one of their Facebook friends were messaging them). Not only that, if the person responds to your comment-response message - they are automatically added as a Messenger Subscriber. This means you can broadcast future messages to them whenever you want (these messages also land right inside of the main Facebook inbox). Thats potentially hundreds, if not thousands of comments that are automatically responded to and then added as Messenger Subscribers. Growing your Messenger Subscriber list has never been easier than with MSGHero. As you can imagine, having the potential to broadcast Facebook messages to thousands of Messenger Subscribers at a time is a huge advantage for any business in any niche. How Do You Set Up a Comment Response Campaign? In order to set up a comment response campaign, we need to click on "Grow" in the top navigation menu and then select "Comment Response". 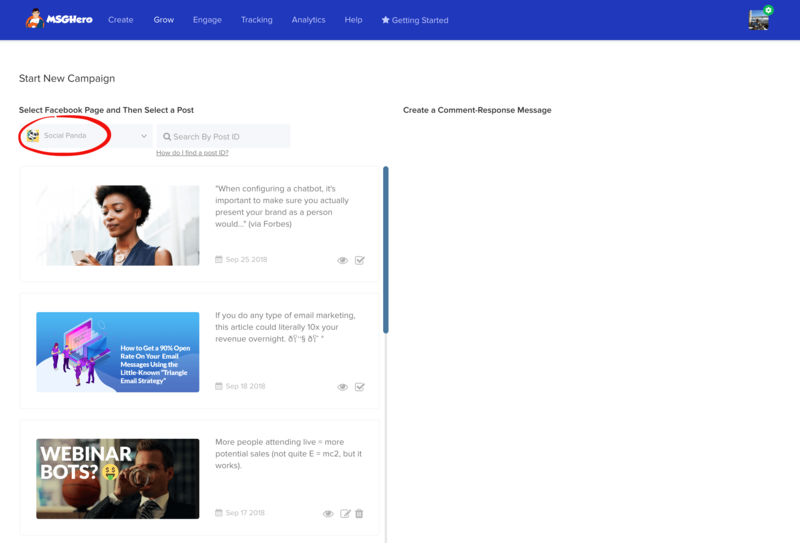 This will take you to your comment response campaign dashboard where you can add/edit/delete campaigns. You're also able to filter your campaigns by your Facebook page. Click on the "Add New Campaign" orange button as shown below. Select the Facebook page you'd like to set up a comment-response campaign on by clicking the "Select Facebook Page" drop-down menu. (Side note: MSGHero automatically syncs all Facebook pages you have admin rights to into the software on your behalf). Our community loves the user-friendliness of this! You can set up a brand new campaign in 2 simple steps. When you select your Facebook page from the drop-down menu, all of your posts will be automatically loaded in a column below (as shown above). 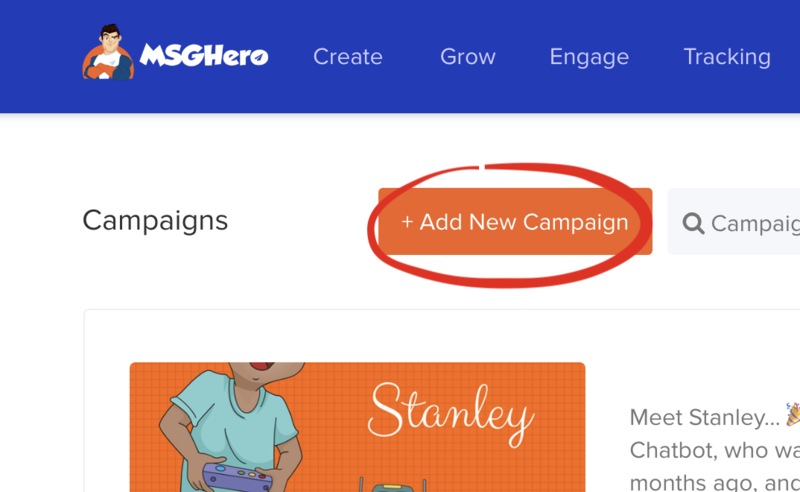 MSGHero automatically pulls all of your Facebook page posts for you so that you can easily select which post you'd like to set up a comment response campaign on. Please note: we also have a "Search by Post ID" field so that if your post does not show up in the post feed, you can search for it by post ID. Not sure how to find your post ID? Click here to view our article explaining that for you. Here's another resource provided by Facebook for finding your post ID. You can only select one post at a time, you aren't able to select multiple Facebook posts at once for the comment response campaign type. Find your post and click anywhere on the post (except the image) and it will show as "Post Selected". 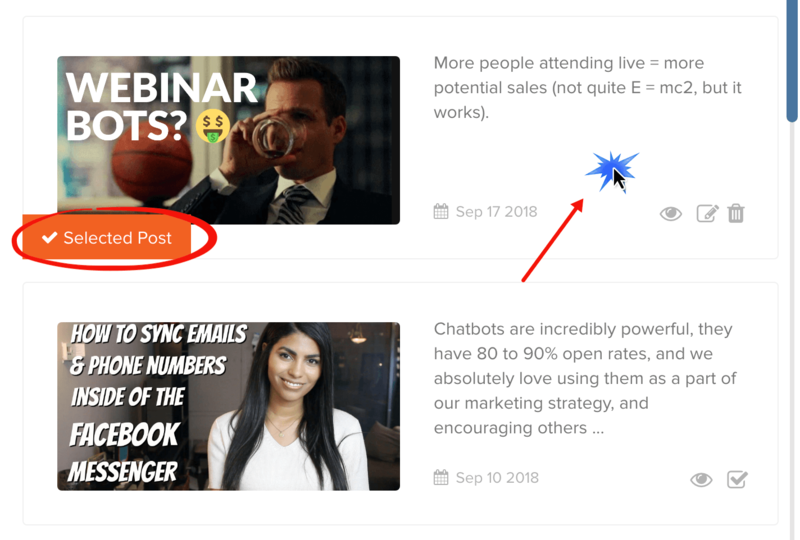 When you select a post, the right column will appear where you can customize the message that will be sent to everyone who comments on your post or ad. Enter your campaign name in the campaign name field for future reference. You'll see a "Message" box as shown in the screenshot above. This is where you can set your new custom message to be automatically sent to people who comment. The purpose of the anti-duplication setting is to avoid responding to the same person twice, if they comment multiple times. This is very common, as people like to comment and then come back and tag friends in another comment. This works on a user-level, meaning if the person comments twice with two different comments, MSGHero is intelligent enough to know not to respond to the second/third/fourth comment regardless of the content of the comment. These two features are completely optional but you can set keywords here for your messaging criteria. Please note, you are allowed to use multiple keywords/phrases in these fields when setting up your campaigns. MSGHero will only send automated messages to comments that contain the keywords your specify here. For example, if your keyword or phrase "support" then MSGHero will only respond to comments with this keyword/phrase instead of replying to ALL comments. Very Important: If you specify keywords/phrases in this field, any comments WITHOUT these keywords/phrases will NOT be responded to. Leave this field empty if you'd like all your comments responded to. Enter keywords here that the software will know to skip when sending automated messages. For example, if you use "hate" as one of your exclusion keywords then when MSGHero finds a comment with the word "hate" in it, it will not send a message to that person. Once you have completed all of your settings as explained above, click on "Publish". Now, if you'd like to set up follow up responses, please navigate to the "Messaging Funnel (Follow Ups)" article. Q1: Does MSGHero work on personal profiles? At this time, MSGHero only works with Facebook pages (not personal profiles/timelines). Q2: How do I connect MSGHero to my Facebook Ads? For MSGHero to work with a Facebook ad, it needs to be a Facebook post. This can be an unpublished/hidden/dark post or a unhidden post. As long as it's a post, it will work. If you can't see your specific Facebook post amongst the rest of your posts please use the "Search by Post ID" field in the comment trigger pop-up box. Not sure how to find your post ID? Click here to view our article explaining that for you. Q3: Can I respond to previous comments? If you have an older post with hundreds of comments, and you want to respond to them AFTER connecting MSGHero to the post - you will not be able to. HOWEVER, any NEW comments that come in after connecting the post to MSGHero will of course be responded to. Q4: How do I remove the page post link from the bottom of my responses? Removing this is unfortunately not possible and is required to be included by Facebook. It's purpose is to be a reference to the user as to why they are receiving your message. If they click on it, they are taken back to your Facebook page post where they originally left a comment and serves as a reminder as to why they are receiving a response from you.